ACT Newsroom & Blog: Building the Workforce of the Future: Where are we headed? Building the Workforce of the Future: Where are we headed? We are often told that it is our failures—not our successes—that shape us for the better and make the most impact on ourselves and our world. With another year behind us, it’s important to look back at the successes and shortfalls of 2017, to inform the opportunities ahead in 2018. Despite my many years in education and workforce policy, I was inspired and renewed by the educators and workforce professionals I met at the ACT Workforce Summit, this past November in Austin, Texas. The individuals I met at the summit are doing the difficult work of helping people find the jobs they want, and I learned so much from them about compassion and their willingness to understand their clients. I also saw how they are really struggling to learn more about local labor markets, the local employers they serve, and how to speak the language of business. We are so lucky to have so many smart, dedicated, caring people in this field. But there is a hunger out there for better information, to make better decisions. During the summit, I heard many stories about vibrant partnerships—business, workforce, education, economic development—and how the people within them felt they needed to learn more so they could do more. These passionate people are itching to help their communities grow and sustain a robust workforce. 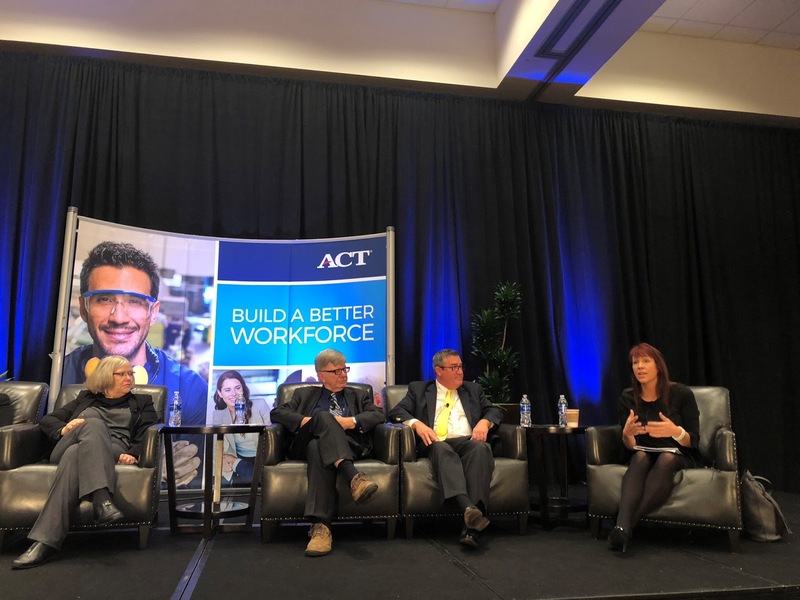 Jane Oates (left) sits on a panel at the ACT Workforce Summit with other leading experts to discuss the role of credentials in closing the skills gap. Align Training to Skills Demand. Local partnerships have to make sure the training in their community is directly aligned with the credentials and skills that are in demand. Training not matched to local demands needs to end. We can’t have stories of people being trained locally and then not being able to find a job. Engage Employers in Credential-Building Process. Credentials need to be vetted with employers to ensure they value them—meaning they will require them for hiring. Not only does a quality credential need to be valued by the employer (required for hiring), but it also needs to be portable (so it has value with more than one employer), and stackable. In this time of continued learning, it is imperative that every credential we earn can dovetail with the next step—to increase an employee’s knowledge and pay. I have great hope that Credential Engine will help everyone understand the usability and value of credentials, and also the ability to build on credentials, even leading to degrees. Build Pathways for All Learners. Local institutions—from high schools to 4-year colleges and universities—must have clear pathways for learners. Pathways should be articulated and built to reduce or eliminate duplication. These pathways should be for high school students and older workers and everyone in between. There should also be flexible scheduling options so people don’t have to wait to enroll at the next level. If a learner is ready today, they should have an immediate way to engage—in person or online. Agree on Assessments. There should be agreement on assessments, including assessments for prior knowledge, so every person enrolling has the highest quality, fastest path to success. Redundancy is unnecessary when there are clear ways to measure competency. The biggest opportunity for employers and job seekers is the increased clarity around job descriptions. More employers are writing competency-based job descriptions, clearly stating the skills that are necessary, which may or may not include degrees. That clarity is good for job seekers, because they understand the skills they need to have to be a strong candidate, while saving employers time and money. Hopefully as they see their competitors having success with this method, more employers will join in 2018. In terms of the hurdles, I believe 2018 will continue to see job shrinkage due to automation, overseas outsourcing, or other job eliminations. We will still have to deal with struggling, dislocated workers, along with those who were underemployed in 2017. Matching skills in a defined geographic area still remains difficult in too many parts of the country. If Americans are unwilling or unable to move where the job growth is stronger, this creates a demand for retraining opportunities. At the summit, people were taking notes, recommending resources, exchanging cards and asking one another tough questions. It was such an amazing, energized work environment. People were amazingly open about not only their successes but also what they had learned from their failures. It was one of the most engaged groups I have ever seen. 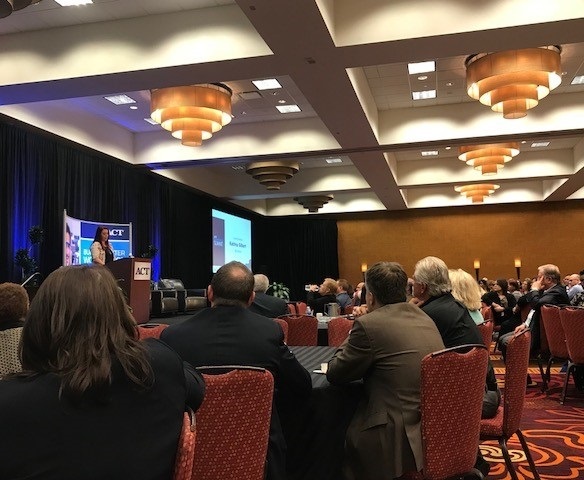 Attendees of the ACT Workforce Summit listen to keynote speaker Katrina Gilbert, of the award winning HBO documentary, "Paycheck to Paycheck: The Life and Times of Katrina Gilbert." As we enter the New Year, with its new challenges and opportunities, we must remember and appreciate the hard work that has led us to where we are and why we do what we do. We must be honest with ourselves and with the public about the challenges we face in our labor market. We must point struggling folks to the best training and supports out there to sustain them along their journey, while celebrating even the smallest of victories with them. I still believe we are the strongest workforce in the world. We will only grow stronger through hard work, celebrations of diversity, and constant communication to review what’s working and what’s not. Here’s to the triumphs that lie ahead in 2018.